We took a look at over 2,600 agencies in MuckRock’s API, focusing on those that had received three or more filed requests through our site. While over 26,000 requests were filed to local agencies, a little over 10,000 of those requests have actually been completed and closed out. It should be noted, that although an agency completes a request, it doesn’t necessarily mean that the records have been released. On average, agencies across the country take about 59 days to respond to requests, despite state-mandated response times. We noticed the majority of our users are heavily interested in law enforcement records, although access to those records is often tricky to get a hold of . Per our data, the top three agencies with the most requests are the New York City Police Department in New York, the Chicago Police Department in Illinois, and the Boston Police Department in Massachusetts. 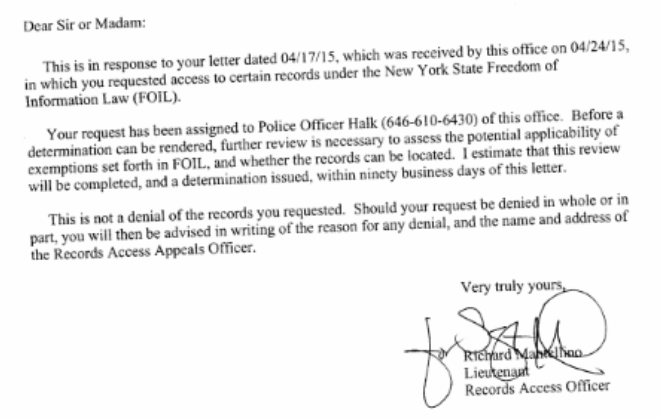 The NYPD, the country’s largest police department, has received a total of 444 requests filed though MuckRock, the highest number of requests received by any agency on the site. However, only 81 of those requests have been completed, and 159 have were rejected - over a third of all requests sent to the NYPD. Many requests to the NYPD remain in limbo following an official acknowledgement from the agency. MuckRock user Alex Richardson has yet to receive further updates following his April 2015 request for meeting minutes, agreements, contracts, and memos. Per statute, New York agencies must respond within five days and include an estimated completion date if applicable. If the agency determines that a request will take longer than 20 days, an explanation as to why that’s the case must be included. In Chicago, 380 requests have been completed by the police department, 181 of which have been completed. 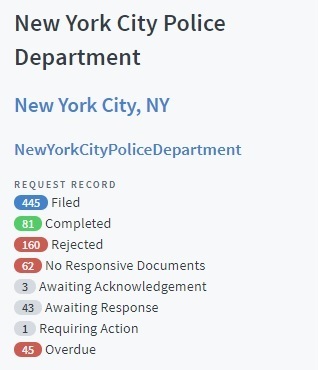 Although a much better rate than the NYPD, the CPD has rejected 30 of those requests and determined no responsive records for another 66 -roughly a quarter of all requests sent to the CPD. Similar to the NYPD, many of CPD’s requests have been acknowledged without further updates on when records, if any, could be released. In the case of MuckRock user J Ader, his request for “Gang Audit Questionnaire documents” is still being processed, according to the agency. The Illinois Freedom of Information Act also requires agencies to respond to requests within five business days, unless they cite one or more of seven reasons why a delay is necessary. 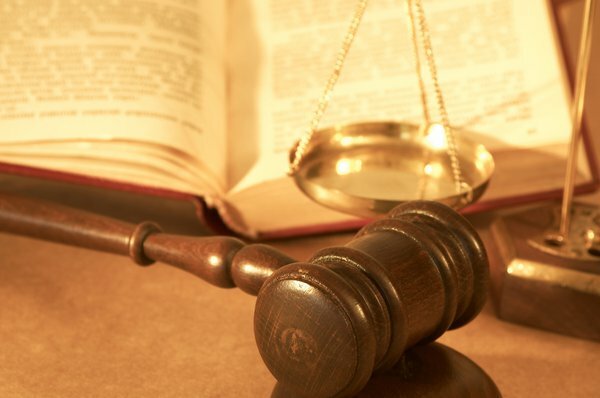 These reasons include records being stored in other locations, records haven’t been located, or the agency needs to consult with an outside body. 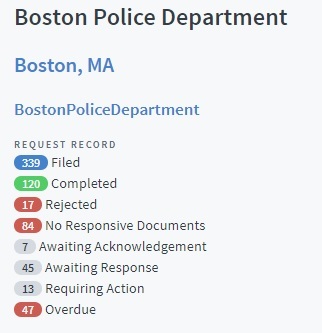 In Massachusetts, MuckRock users have filed 336 requests to the Boston Police Department, 120 of which have been completed. In contrast to the other two most sought out agencies on MuckRock, the BPD has only rejected 17 requests. However, 46 requests are pending resolutions. The BPD is nowhere near our top three law enforcement agencies with the longest average response time. The Eastland County Sheriff’s Office in Eastland County, Texas takes an average of 1,438 days to respond to requests. In Gloucester, Massachusetts, the Gloucester Police Department takes an average of 1,201 days to respond. Also in Massachusetts, the Southbridge Police Department takes an average of 1,146 days to respond to their requests. Each of these agencies has about seven requests filed by MuckRock user. Still, their average response times reflect many of the frustrations requesters face while dealing with law enforcement agencies. It’s not coincidence many of our top agencies point to law enforcement entities. Requesters and the general public continue to wrestle with exemptions into internal investigation documents or other closed off data mandated by the state. Nonetheless, the general public continues to be heavily invested in the inner workings of these entities. We’ll continue to look at our data to find the trends in public records requesting across the country. 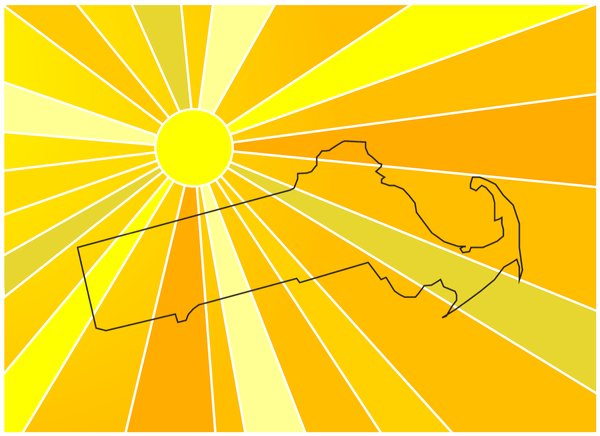 In the meantime, take a look at our State of State Public Records Law Project for more on the current state of your law. Plus, if you have your own records struggle, let us know via the form below!